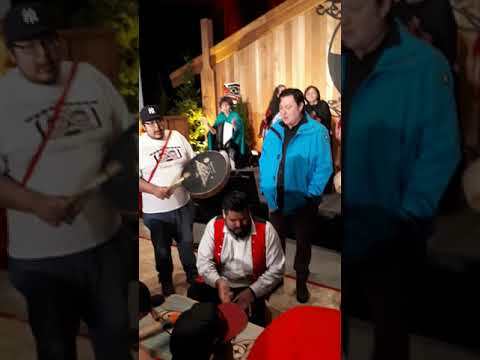 A new program is being offered to young men in Ahousaht that promises to teach them not only important life skills, but also cultural teachings to build a renewed sense of pride in their community spirit. The Ahousaht Way Warrior Program was launched in the community on Sept. 11. Supported by Dr. Ricardo Manmohan, the men meet once a week to take part in healthy activities that include outdoor survival training, gathering/harvesting, fishing/hunting and yard work. At some point the young men will be expected to chop wood for the elders. With 18 years of military background, Manmohan is trained in leadership development. He helped create the Warrior Program in Hitacu four years ago and, through trial and error, has learned that it is people from the community that determine the success or failure of programs like this. “I went to one community and asked around why the men’s group didn’t work; their answer was that men don’t want to sit around in a circle – they want to get out on the land,” said Manmohan. And that is how the program came to feature active, hands-on content that require older men to come in and teach their skills to the younger ones. The program is open to all males in the community but is specifically designed for the younger ones ages nine to 17. The program will split the into two groups: one for the younger ones and the other for ages 14 and up. Every Tuesday the boys meet at the school at 3:30 for 90 minutes of physical work, ending with a dinner. Following dinner they gather for an hour or two of discussion, led by a mentor. “The Ahousaht Way will weave the traditional Ahousaht language, culture and spirituality with outdoor survival skills and leadership development,” Dr. Manmohan writes. Older men in the community will take part as guest speakers, mentors and teachers – guiding the young men as they learn about self-identity and what it means to be a warrior in the community. It is about building their confidence and capacity to be warriors. “As warriors, men are the protectors of women, children and each other. The task of a warrior is to stand up and act against violence and lead as healthy role models within the community,” Manmohan wrote. The program came about thanks to the efforts of Ahousaht member Tom Paul, who takes an active role in providing safe activities for the youth of the community. Paul and his wife Marsha dedicate much of their time to working with Ahousaht youth on a volunteer basis. They sought out funding, donations and volunteers to open Ahousaht’s youth centre so that the kids would have a safe, warm place to socialize and have fun. Paul heard of the warrior program being offered to Yucluthaht youth and was impressed with the results. He began writing proposals in search of funding to have the same program delivered in Ahousaht. The First Nations Health Authority delivered with enough funding to run the program for one year. According to Manmohan, the program has also launched in Tla-o-qui-aht. In the first two weeks of the program approximately 40 boys took part. They were invited to the school gym to take part in physical activity like canoeing or archery, followed by dinner then discussion. Guest speakers including members of the RCMP, NTC biologists, a local physician, ha’wiih, and elders will come in to mentor the young men. “We want to change the way they’re thinking; we will teach them about community work, helping the elders and giving back,” said Paul. There will be monthly weekend retreats where the men will teach the younger ones how to fish and harvest seafood at one of Ahousaht’s rivers. The following month they will go to the same river to learn navigation and hunting. Toward the end of the year they will spend a weekend learning about hunting and outdoor survival skills. Maaqtusiis Principal Kate Drexler says the school supports the program by promoting it and providing space including the gym, kitchen and meeting room. In addition, they will explore the possibility of having the program accredited so that students taking part in the program earn high school credits. SD 70 has accredited the program for their students in public high schools in Tofino and Ucluelet. Drexler says she is hopeful Ahousaht’s Maaqtusiis Secondary School, a independent school, will follow suit. Paul said that his intent is to teach the young men about stewardship and salmon conservation by having them build a cabin shell at one of the rivers. This allows them to learn about the lifecycle of the sockeye salmon and develop an interest in protecting them against poachers as they head upriver to spawn. While funding is in place for only one year, Paul envisions the program carrying on for many years. He is making plans to launch a similar program for the young women of the community.